"The hearty cedars of Lebanon are the trees of the Lord, which He hath planted." Fr. 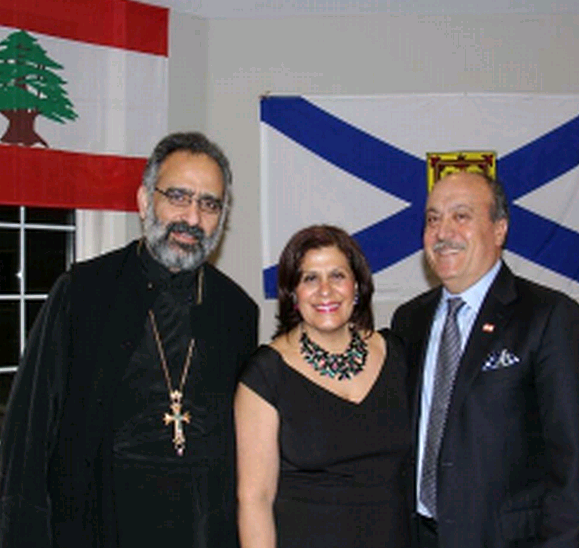 Maximos Saikali and Cathy & Wadih Fares (Lebanese Consulate Halifax). The local Lebanese festival is a means by which Lebanese-Canadians and their Canadian offspring convey their thanks to fellow Nova Scotians. It is a joyous event where Haligonians can experience the hospitality, tasty cuisine, and culture of people from the Levant. The local Lebanese festival began in 2002, and the idea emerged partly from tragic events that occurred the previous year. The September 11th attacks were a crime against humanity that resulted in the deaths of countless innocent civilians, and our fellow house of worship Saint Nicolas Orthodox Church was also destroyed that day, as it resided near the Twin Towers since 1916. The Ecumenical Patriarch Bartholomew, leader of the world’s 300 million Orthodox Christians, subsequently assembled an interfaith group of spiritual leaders and condemned the attack along with his Jewish, Christian, and Muslim counterparts. In parallel with Patriarch Bartholomew's efforts to foster awareness and dialog, the Parishioners of Saint Antonios and their Priest Fr. Maximos Saikali decided that a festival would be beneficial. Bread would be broken and shared, as Jesus had done with his disciples, and Haligonians would experience the warmth and hospitality of people from the Levant. In 2001, thanks to the arduous efforts of numerous Parishioners and donors, the Church brought the Olympic Community Hall into its fold in order to host charity, wedding, baptismal, and other events. The Olympic Hall was also the ideal place to house the festival, as it featured a large parking lot where grilled delicacies could be enjoyed outside in the summer Sun, and the Hall’s interior stage could host live singing and dancing. Moreover, the venue could accommodate numerous attendees, and proceeds generated from those visitors could be directed toward Saint Antonios’ philanthropic efforts (e.g., Feed Nova Scotia or the IWK). Our Parish, like numerous local organizations and individuals throughout Halifax, aims to give back. That goal is of particular importance to members of Saint Antonios and our sister Church Our Lady of Lebanon, many of whom sought refuge and a new life in this welcoming country. Admittedly, our efforts often seem insufficient and we're always striving to improve. Moreover, we humbly recognize that philanthropy is an endeavour that warms the hearts of both the donor and recipient. 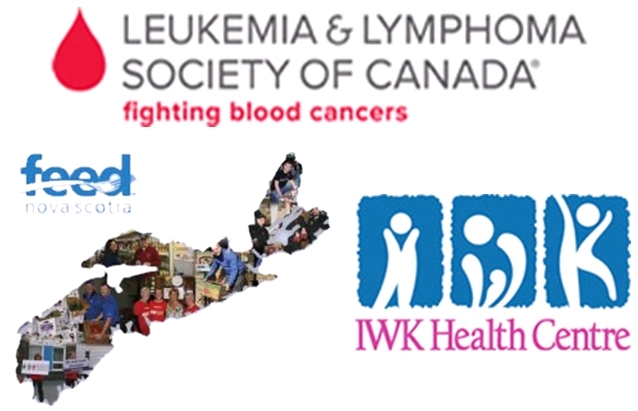 Indeed, Saint Antonios has previously partnered with groups such as the Leukemia & Lymphoma Society of Canada, to help raise funds and increase awareness. Leukemia and lymphoma are certainly pernicious, with the former being a cancer that emerges in the bone marrow, and the latter being endemic to the lymphatic system. Nearly 10% of all cancers fall into the aforementioned groups. Excess funds generated from the festival were also directed to save Saint Matthias Anglican Church and its Community Centre from demolishment. The organization has a rich legacy and was a staple of the Halifax-Chebucto region for 130+ years. Saint Antonios Parishioners Anthony Saikali and Vanessa Taylor discuss Leukemia & Lymphoma. In August 2002, the festival had its successful beginning, and thirteen years later the festival continues to grow. 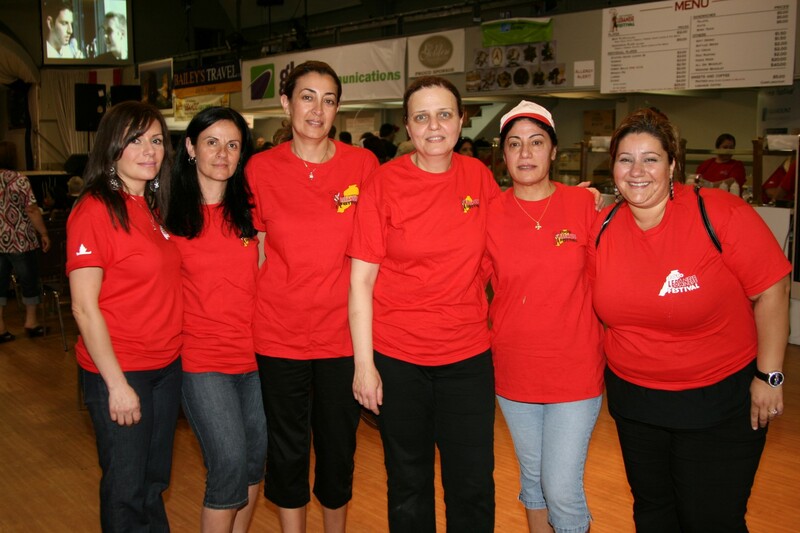 The Lebanese festival now hosts thousands of Haligonians annually, and preparation for the event occurs months in advance. Saint Antonios Parishioners volunteer nearly full-time in the weeks preceding the festivities. Ultimately, the Parish feels blessed to reside in beautiful Nova Scotia, and among its welcoming communities. Our broader Lebanese Maronite family also run an annual festival that occurs in early June (Cedar Festival). Saint Antonios Parishioners Amanda Nahas & Nicole Zhouri sing the anthems of Canada and Lebanon. Chantal Khoury recites her poem entitled 'Common Ground'. Aida Hachem Mrad placing a wreath on behalf of the Lebanese Consulate. There are numerous notable Canadians whose heritage is linked to the broader Levant. While celebrating the joyful Lebanese Festival, we are always mindful of the sacrifices such individuals have made. Edward Arab, Marc Diab, and Joe Ghiz are examples of such admirable people. - 7/17/2015, an earlier entry of this post featured an incorrect assertion regarding operation Vitality. We hope to provide additional information in the coming weeks concerning the operations surrounding Bergen op Zoom and Wouwsche Plantage, as we review the documents received. Edward Francis Arab is the grandson of Abraham and Annie Arab, and the son of Louis and Sadie Arab. His grandfather was among the first villagers from Diman (Lebanon) to settle in Nova Scotia. At the age of 22, Edward was one of the youngest to graduate (with honors) from Dalhousie Law School in 1937 (he obtained a BA in 1935). Edward was invited to join a law firm, but decided to open his own practice. Most importantly, he gained a reputation for working on cases that combated prejudice and racism. He firmly stated that no immigrant, African-American, or person of poverty should be refused, regardless if they could pay. Edward was proud of his Lebanese heritage, and was the first president of the Canadian Lebanon Society (1938). It is unsurprising that Edward enlisted for WWII given his moral disposition to defend those in need, and his pride in being Canadian. Edward became a Lieutenant in the Lincoln and Welland Regiment. In MLA Patricia Arab's mother's article, she recounts that he was wounded in the leg while in battle, and after medics tended to his wounds, he returned with his troops to forge ahead. That heroic act inevitably led to his death. It was October 25th 1944, and he was merely 29 years of age. 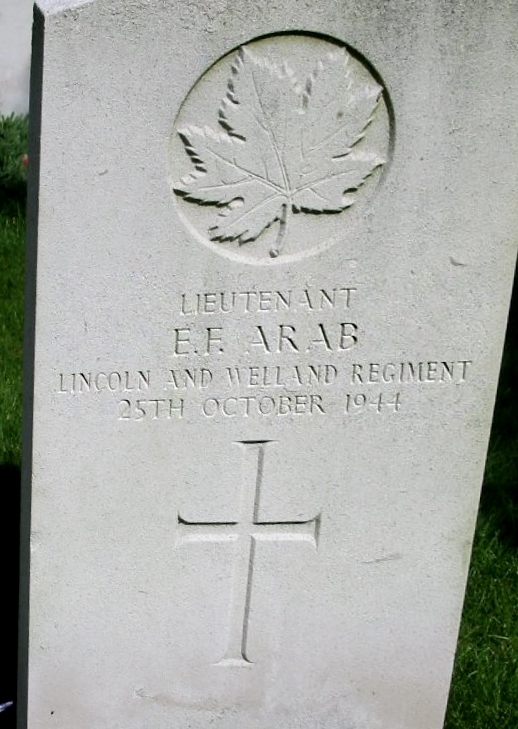 Lieutenant Arab, and numerous other Canadians, were killed in the Battle of the Scheldt Estuary (Holland). It is important to delve into the Battle of the Scheldt Estuary, in order to comprehend the sheer courage that Edward and the Allies exhibited during a seemingly insurmountable challenge to retake the area. The terrain was flooded, muddy, and the Germans established fortified defenses. The fight was especially grueling, and the battlefield is considered among the most difficult of WWII. 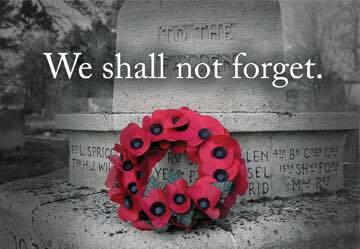 Ultimately, the Canadians suffered 6367 casualties (killed, wounded, or missing) during the effort. To comprehend the importance of the battle where Edward Arab lost his life, we begin by reviewing the prelude to the months-long struggle for the broader Scheldt Estuary (a network of water passages and land areas linking the open sea to the inland city of Antwerp, Belgium). The Allies landed on the beaches of France in June 1944, and pushed eastward toward Belgium and into southern Holland. With tens of thousands of troops fighting across the front, significant supplies were needed. Consequently, capturing a major port became a top priority. The British had seized Antwerp, which as Europe's second largest port, was critical for continuing the war effort. However, the Germans still controlled the Scheldt river, which connected the inland port of Antwerp to the open sea (examining a map will immediately convey the geographic context). Field-Marshall Montgomery and General Eisenhower eventually made securing the Scheldt a priority. For the Germans, it was clear they could face inevitable defeat if a major supply route was opened by the Allies, particularly one in such close proximity to Germany itself (Antwerp and Düsseldorf are separated by a mere 200 km). To hamper the Allies, the Germans launched more V2 missiles at Antwerp than any other city. The task of liberating the Scheldt was partly entrusted to the Canadians, and as noted the terrain made the challenge daunting. In terms of geographic context (examine the map), North of the estuary lay South Beveland, and beyond that lay the island of Walcheren, which was transformed into a powerful German stronghold. The Allied plan to open the estuary involved four main operations, which were in part done concurrently: i) Clear the area north of Antwerp and secure access to South Beveland; ii) Clear the Breskens pocket behind the Leopold Canal; iii) Breach and capture South Beveland; iv) The final phase would be the capture of Walcheren Island. Throughout October 1944 to Edward’s death on October 25th, fighting was fierce and the entrenched German forces slowed the Allied advance. Casualties were heavy as Canadian troops attacked over open flooded ground. The Canadian effort to bypass opposition and seize bridgeheads was hindered by mines, mud, and strong enemy defenses. But those defenses were eventually compromised and the entrance to South Beveland was breached, and the advance into South Beveland began. South Beveland was critical, as the only land approach to the (heavily fortified) island of Walcheren was a narrow causeway from South Beveland (see the map). To exacerbate matters, the flats that surrounded this causeway were too saturated with water for movement on foot, yet too little water existed for an assault via storm boats. The island was attacked from all directions. On November 8th, all enemy opposition in the broader area was suppressed. Thus, the Battle of the Scheldt was essentially won and a crucial supply line would be established. The channel was cleared of mines and on November 28th the first convoy entered Antwerp. Those Canadians who participated in the Battle of the Scheldt helped bring peace to Europe. A sizable majority of the Canadians who died in the Battle of the Scheldt are buried at two cemeteries. Adegem Canadian War Cemetery is in the northwest corner of Belgium, near the border with Holland. Bergen-op-Zoom Canadian War Cemetery is located in southwest Holland. It contains the graves of nearly 1000 Canadians, including the resting place of Lieutenant Edward Arab. 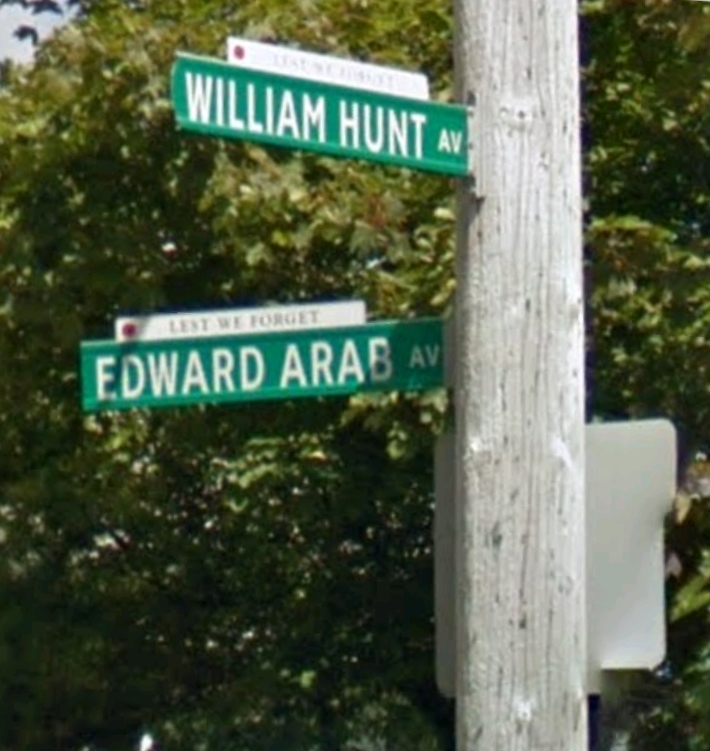 Edward Arab Avenue & William Hunt Avenue in Halifax, Nova Scotia, Canada. "Could I have your consideration for the name of Edward Arab to be used for a street in the new Westmount subdivision. Mr. Arab was born and brought up in the City of Halifax. He attended St. Patrick’s School and later Dalhousie University. He was a winner of many prizes for scholastic efforts while at high school, and was a leader for two years of the entire class at Dalhousie Law School where he graduated as one of the youngest lawyers in the Province of Nova Scotia. It was not only in the academic field that he was outstanding. Among his athletic achievements was the Maritime Inter-scholastic Boxing Championship for his weight for two years running. Shortly after taking up the practice of Law, he offered himself as a candidate for City Council. For a reason which came up that he felt of significant importance, he withdrew his name before the election, but it is indeed probable had he lived, that he would have re-offered and his sterling qualities been recognized by the electorate. The writer knew Edward Arab as independent, aggressive, clear-thinking and a very dear friend. As a lieutenant in the Army, he lost his life leading an attack on the open fields of north Holland, in a section of the bitter fighting that took a heavy toll on Canadian lives. His many friends and family would be grateful that his name be commemorated in this way. Joe Ghiz - "I consider it a mark of the greatness of our Country (Canada), and the greatness of our Province (PEI), that the son of an immigrant can be elected first minister." There are numerous notable Canadians whose heritage is linked to the broader Levant. In advance of the 2015 Lebanese festival (July 9->12th), we are highlighting such individuals. In this post we share the story of Joe Ghiz, who is still fondly remembered by many immigrants for being a Harvard-Dalhousie educated Lawyer who became head minister of Prince Edward Island, and set an example that garnered an admirable reputation for Lebanese-Canadians. Most recently, the Honourable Lena M. Diab and MLA Patricia Arab have followed in Ghiz's footsteps, and are key members of the government of Nova Scotia (Canada). All are role models for young Saint Antonios Parishioners and members of the broader community and Levant. "I consider it a mark of the greatness of our Country (Canada), and the greatness of our Province (PEI), that the son of an immigrant can be elected first minister." - Joe Ghiz. There are numerous notable Canadians whose heritage is linked to the broader Levant. In this post we share the story of Joe Ghiz, who is still fondly remembered by many immigrants for being a Harvard-Dalhousie educated Lawyer who became head minister of Prince Edward Island, and set an example that garnered an admirable reputation for Lebanese-Canadians. Most recently, the Honourable Lena M. Diab and MLA Patricia Arab have followed in Ghiz's footsteps, and are key members of the government of Nova Scotia (Canada). All are role models for young Saint Antonios Parishioners and members of the broader community and Levant. Fr. 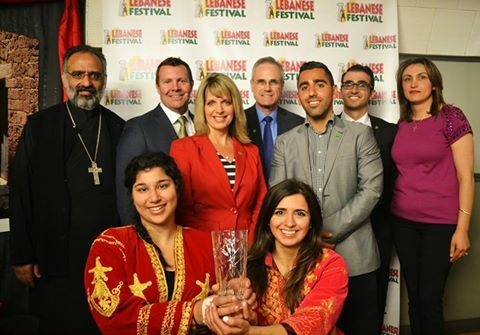 Maximos Saikali, Wadih Fares (Lebanese Consul Halifax), MLA Patricia Arab, Bishop Marwan Tabet, The Honourable Lena M. Diab, Fr. 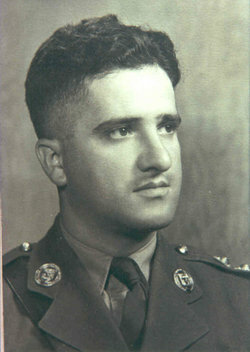 Pierre Azzi. Marc Diab was born in 1986 in Ain Ebel (Lebanon), and his family moved to Canada in 2000. Marc became a Canadian citizen in 2004 and lived in Ontario. He is the son of Hani Diab and Jihan Falah. 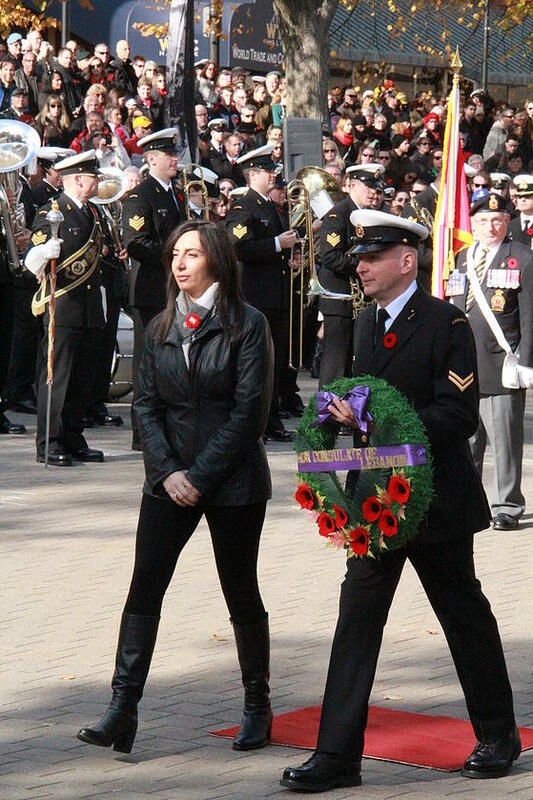 Marc was a member of the Royal Canadian Dragoons based at CFB Petawawa (Ontario). While serving as a member of the 3rd Battalion, his vehicle encountered an IED (near Kandahar city) and he was killed. He was just 22 years old, and only weeks away from coming home. Four other soldiers were wounded in the attack. 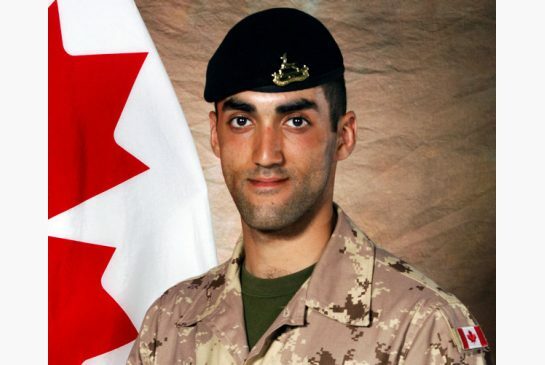 Prime Minister Harper extended his condolences to Diab's family and friends, and hoped that the other wounded soldiers would make a speedy recovery. “Trooper Marc Diab paid the ultimate price serving his country," the Prime Minister said. "His life and death serve as an example of the bravery and outstanding dedication of Canadian Forces members on this mission." Friends, family, and the Lebanese-Canadian community packed a Church in Toronto for his funeral. As a children's choir sang, Canadian soldiers carried the flag-draped casket into Our Lady of Lebanon Church, where Diab had played keyboard and taught Arabic. Moments earlier, firefighters and police officers saluted the soldier's casket as it passed, and locals paused to honour the procession. During the service, Fr. Emmanuel Nakhle spoke of the impact Diab's death would have on the community, and the sacrifices he made. "You lived as a spectacular hero, and you died as a spectacular hero," Nakhle told mourners. Charbel Barakat, the father of the Diab's future bride, noted that Diab had told him, "I will make you proud." Barakat confirmed that, "Well, you really did it son. Everybody is proud of you. Rest in peace, soldier of peace." The assembly was also shown a video prepared by Diab in case he didn't survive his tour. Julia Shemali told CBC News that the Lebanese community was affected by his death, but .. "very proud of him. He paid a very high price, but it's his wish to serve the country." 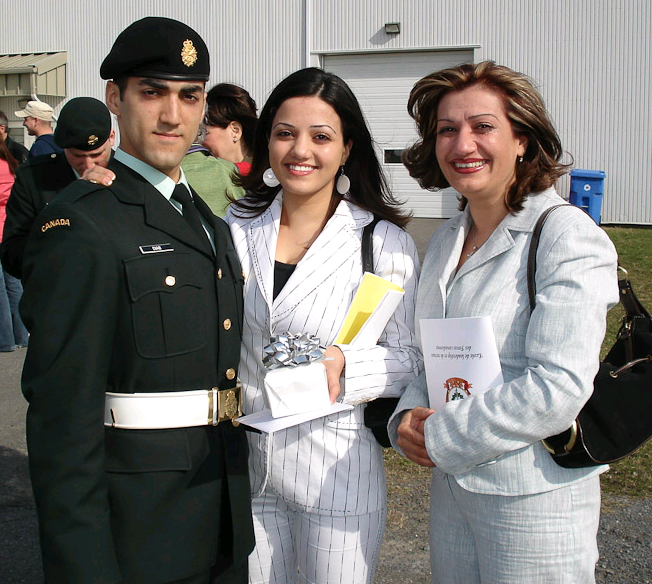 Jihan Diab said her son was proud to be a Canadian soldier. She likewise noted that he planned to marry long-time girlfriend Mary after she finished university, and hoped to start a family. Trooper Marc Diab Memorial Park in Mississauga was inaugurated in his honor. 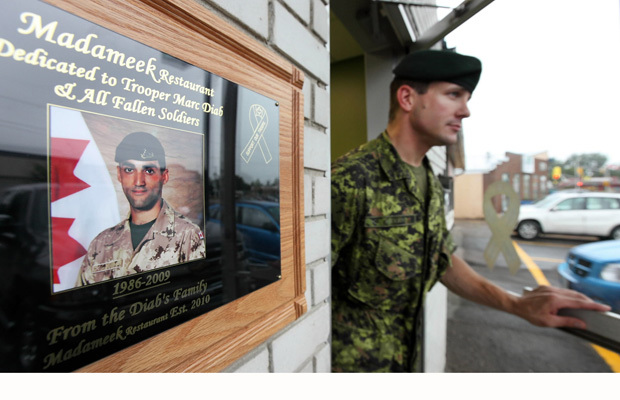 His family and relatives also opened a Lebanese restaurant in his memory, just next to his base in Petawawa. It was his dream to open a restaurant after his military career ended.